Maps and Map Posters have been long used throughout in history. They are very useful when you need a detailed view of a specific area, may it be a city or a country that has to be represented on the map. Despite the popularity of digital maps like Google Maps, maps printed on a paper still remain to be a great tool to use during an adventure. But how they are better than digital maps? For example, if you’re traveling to New York City, New York map posters would not only tell you where to go, but they will also mark the most popular destinations and after your trip, you can hang them on your wall! 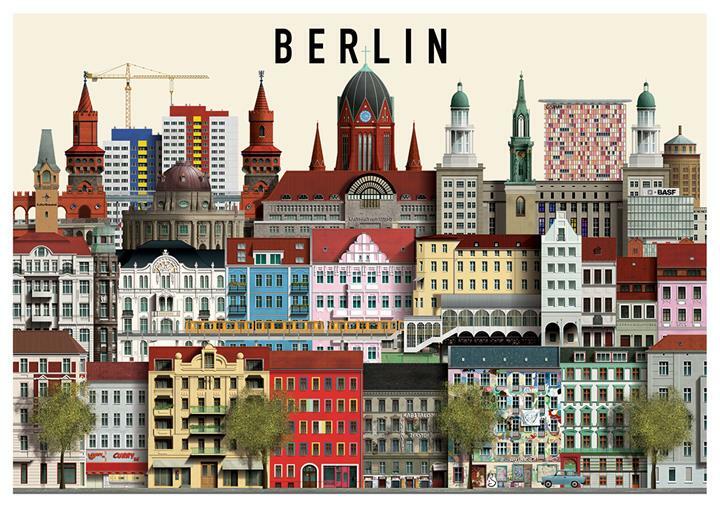 How nice would it be to fill your walls with map posters from the cities you have visited? 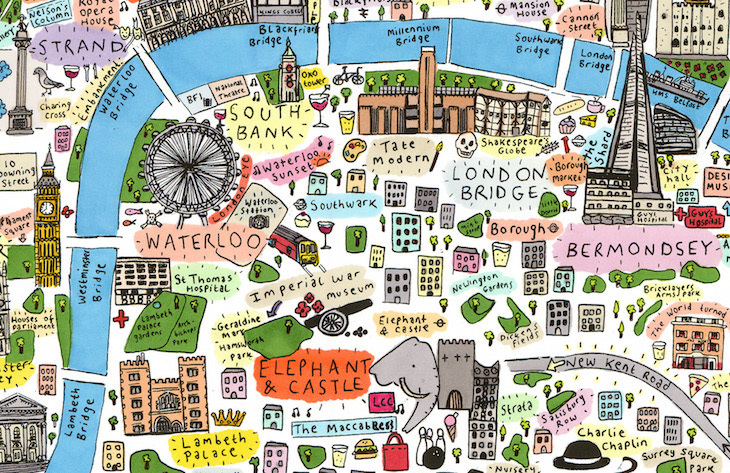 In this article, we will give you an overview of useful map posters that will shape your understanding of the world’s most famous cities. New York City is not only known as the biggest city in the United States, but it is also famous for being the most populated city in the country. Labeled as the City that Never Sleeps and The Big Apple, New York City poster map will guide to the country’s hub for international financial, media, culture, entertainment, and fashion. New York was once known as New Amsterdam following the trading posts of Dutch that were established in the city. The phrase “Big Apple” was first made popular by a newspaper editor, John Fitzgerald, who titled his column: Around the Big Apple. Fitzgerald heard this term being used by Black stable boys to describe the city as a place of opportunity. The first pizzeria in New York was opened in 1895 by Gennaro Lombardi, which sparked a craze for pizza in the city. New York City Subway buskers actually need to undergo auditions to be allowed to busk. In 2018, New York City will open the world’s first underground park. Saying the name Paris alone sparks brilliant descriptions for many. From its well-known artworks to its spectacular architectural design, remarkable landmarks, and endearing beauty, this city is without a doubt one of the most sought-after cities among travelers. 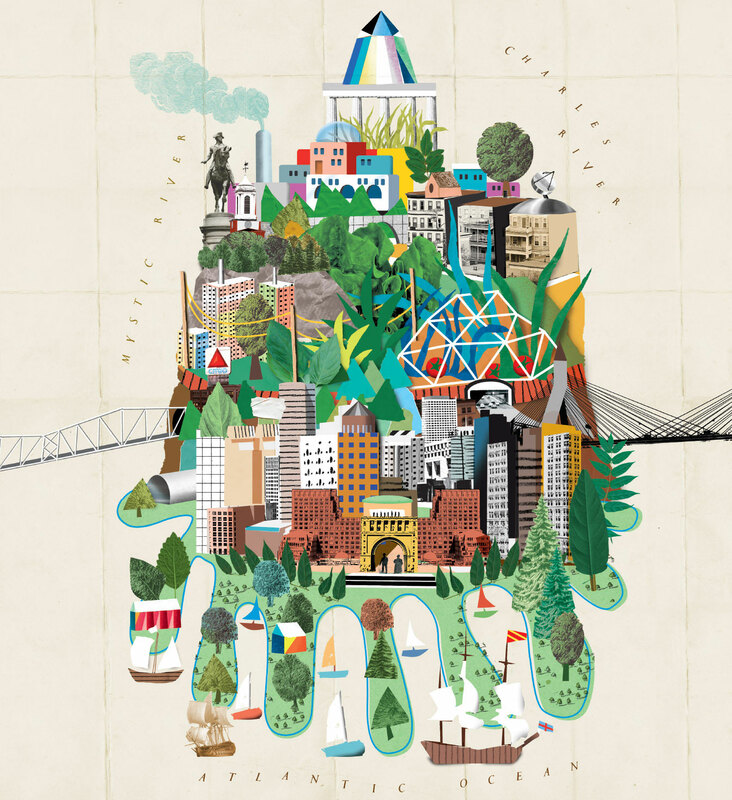 With Paris map posters, exploring this romantic getaway will be unforgettable. So, here you will find Paris map posters that include some of the most famous landmarks you shouldn’t miss while in the city. There’s something so magical about this beautiful place that’s why it is no wonder why this is included in most travelers’ bucket list. This map contains phrases that commonly linked to each area in Paris. 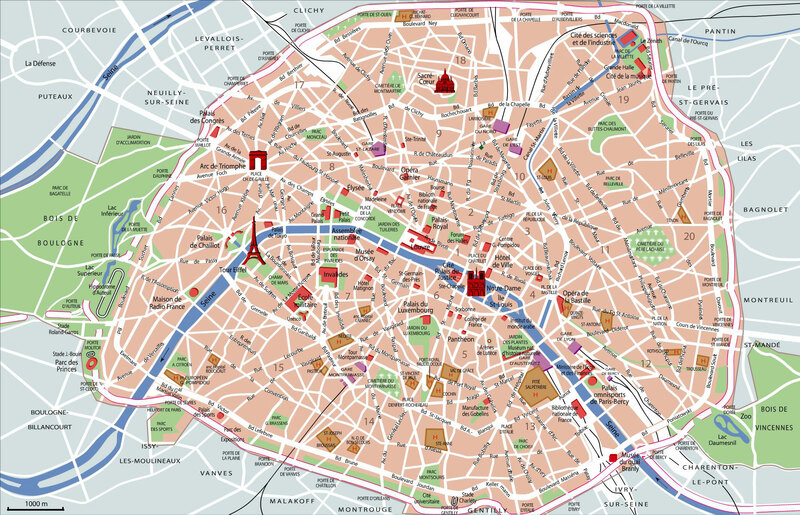 This map showcases some of Paris’ attractions, sightseeing, museums, sights, monuments and other interesting sites. Paris’ most iconic structure that is found in any map of Paris poster, The Eiffel Tower, actually moves! During bad storms, it has been you may expect for it to sway by up to 13cm; while during the hotter days, up to 18cm. Paris is not the largest French-speaking country in the world, but Kinshasa, Democratic Republic of Congo, in Africa. There is only one Stop Sign in the whole city Paris. Eiffel Tower is not the most visited attraction in the city but the historic Notre Dame Cathedral. And so this Chicago map poster highlights how locals see their state. Chicago is the capital of Illinois and so here is a map poster of how Chicagoans see the state (& themselves). Chicago is the first city to debut an all-color television station on April 15th, 1956. The first televised US presidential candidates’ debate was broadcast from CBS Studios in Chicago in 1960. Chicago River does not just run through different canals and systems, but it’s also the only river in the world that flows backward. From the top of the Willis Tower, you will see four other states namely Illinois, Indiana, Wisconsin, and Michigan. Chicago has the largest collection of impressionist artwork in the United States. Chicago is ranked in the top-10 for the most expensive cities to rent an apartment or buy a home in the United States. Amsterdam because of the astounding number of bicycles, beautiful bridges, pretty canals, markets, and cinemas are the reasons why many tourists are attracted to the city. On top of that, Amsterdam is also filled with modern architecture built organically between historical buildings and facades. Because this city is not that big, all attractions are within an acceptable distance which can easily be accessed on bicycles with the help of Amsterdam posters. Below are the Amsterdam map posters that are showcasing interesting facts about Amsterdam. This map shows how Airbnb took over Amsterdam. 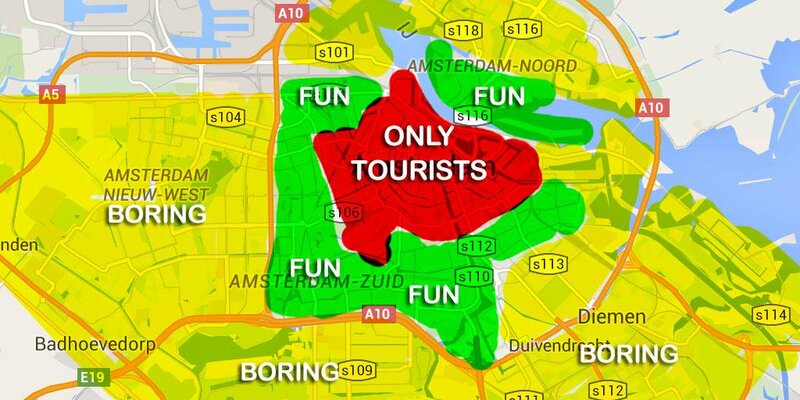 This is a funny map that shows what tourists should expect when they visit Amsterdam. Amsterdam has more than 165 canals and 1280 bridges, which is why it is also notably known as the Venice of North. Amsterdam has the most number of museums per square meter. The city has a bar that allows you to drink while riding known as Cycle Beer Bar. Amsterdam has the oldest stock exchange in the world. The city’s name is originated from ‘Amstel Dam’ which is a dam built over the Amstel River. If London was a country, it would be the eighth largest in the entire Europe. That’s because this city is made up of two old cities which were combined together. Today, London is one of the most visited cities in the world. It’s not very surprising as this city has something for everyone: from culture to history to fine dining and parties. This map shows funny stereotype on what kind of people live in a specific area of London. This shows funny stereotype Londoners associate with each area of the Great Britain. There are 15 secret rivers that flow under the city. It took 7 long years and people from 5 different countries to finish the London Eye. 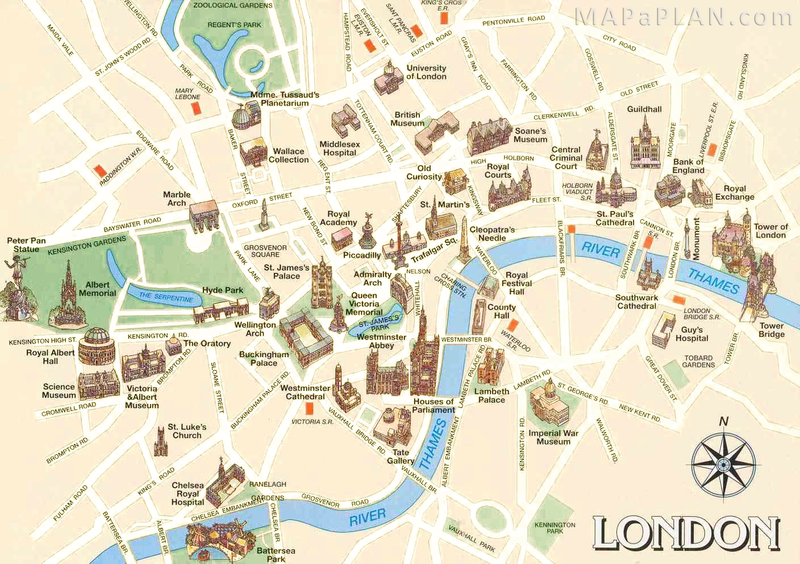 London used to be called Ludenwic, Londonium, and Lunenburg! In the UK, drivers drive on the left side of the road, but there’s a road in London where driving on the right side is alright. London tried to compete with Paris’ Eiffel tower by constructing a structure taller than that but due to poor construction, it was demolished. About 78.3 miles away from PyeongChang, which is the city that will host the 2018 Winter Olympics, South Korea’s capital city, Seoul, is a home to more 10 million people. This humongous city is blessed with four touristic spots that have been awarded UNESCO World Heritage Sites. Aside from being known as one of the best places to shop, traveling here would make you stumble upon a lot of markets, museums, restaurants, and high-rise buildings. With a population of almost 10 million, Seoul is the densest region in the country, this Seoul map poster that shows the city’s population density per square kilometer. This map shows some of the must-see attractions in Seoul. With an average of 26.1 Mbit/s, Seoul has the fastest internet connection in the world. Seoul has become the first city in East Asian city to use electricity during the late 19th century. The city formerly had a fortress stone wall constructed around it in 1397 which was used to protect the city from invaders such as thieves and wild animals. Next, to Paris, Seoul has the second densest population in the world. The city has a big cafe scene, with cafes seen at almost every block. One of the liveliest cities in the world, Tokyo is one of 47 prefectures of Japan, comprising of 23 central city wards and numerous cities, villages, and towns on the west side of the city center. This megacity filled with neon lights, high-rise buildings, businessmen, packed trains, innovative architecture, and revolutionary technology is one of the most interesting cities to go. With the help of a Tokyo map poster, you can compare this city to other popular cities in the world, some of which are London and New York map posters. This is a map that compares the city vs. the whole country – Tokyo vs. Great Britain. This is a map that compares Tokyo to New York map posters. In other words, Tokyo is HUGE. So let’s see what are other interesting things about this marvelous city. 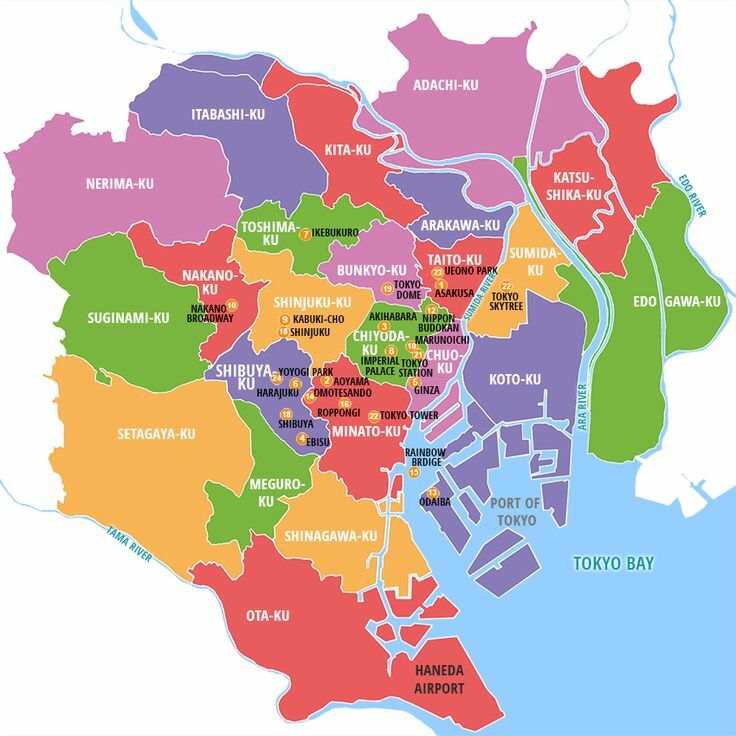 Tokyo used to be named as Edo in the 20th century. There are 14 3-star Michelin restaurants in the city. Tokyo’s Tsukiji is the busiest seafood market in the world where 5 am tuna auction takes place. The Shinjuku station has 36 platforms and 200 exits. Tokyo Tower gets repainted every 5 years using more than 7500 gallons of paint. 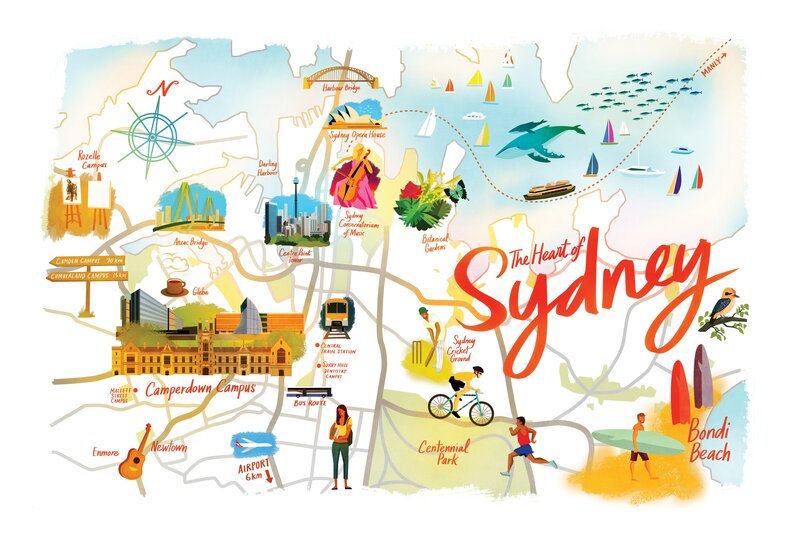 Sydney is the most populous city in Australia and Oceania. Located on the east coast of Australia. This is the map of Australia showing that there are very few cities with the population above 100 people per square meter. One of which is Sydney, of course. 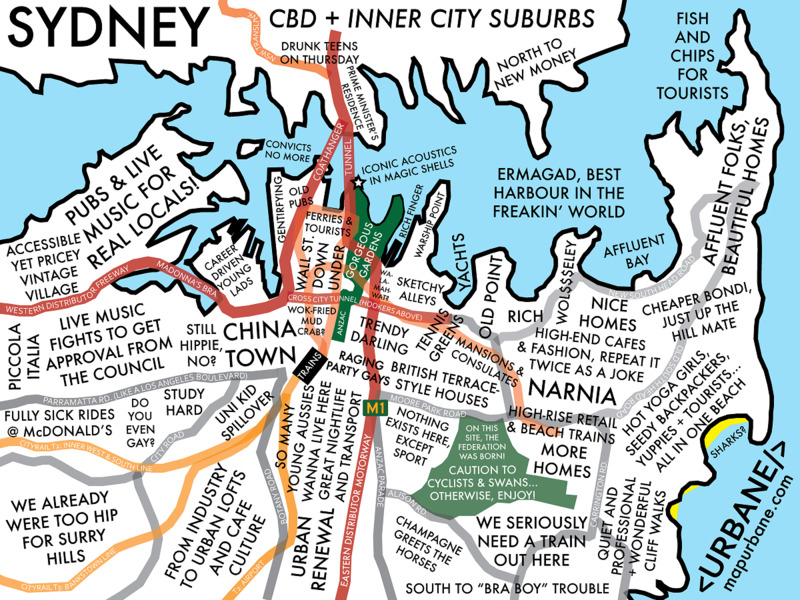 This map shows how people of Sydney see their city. The city is positioned at the same latitude as Buenos Aires, Beirut, Casablanca, Cape Town, as well as Los Angeles. More than 230 films have been set in the city, including Finding Nemo. Aside from English, Arabic and Chinese are widely common languages spoken in the city. Sydney is not Australia’s capital, but it is Canberra. Philadelphia is the biggest city in Pennsylvania. Philadelphia is a small-scale version of the whole United States as its citizens belong to different communities, races, ethnicities, and religions. Without further ado, have a look at some fascinating Philadelphia map posters. This map poster shows the number of houses abandoned in the city by area. This is a map poster that shows where most crimes take place in Philadelphia. Red spots being the most and blue ones being the least. Philadelphia used to be the capital of the United States. Logan Square, which was named after James Logan, was the site of a lot of public executions. With more than 2,000 giant art pieces, Philadelphia is known as the Mural Capital of the Country. Philadelphia experienced many firsts in the United States: the first zoo, first university, first lending library, as well as the first cheesesteak. Well-known as the historic heart of the United States automotive industry, Detroit took on the name “Motor City.” The automotive industry in the city offered the model for mass production that other industries later followed all over the world. This historic American city has a humble root being a French trading post in the early 18th Century, but today, it grew to become one of the country’s biggest cities. This is a funny map that shows how people in Detroit look at their city. 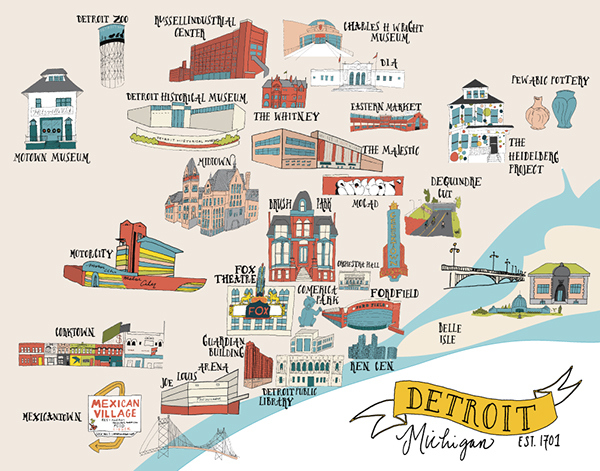 This is a Detroit map poster that shows where people live and where they work per square miles. As you can see, people in Detroit choose to work outside the city and commute each morning. Detroit was the first city in the US to have paved road for easier transportation. Detroit is where of Techno and Motown was born. Approximately 1,200 feet underground is where the 1,500-acre Detroit Salt Mine lies. Detroit River is actually is not a river but a strait. Detroit was the first city in the country to assign unique telephone numbers in the year 1879. Ontario’s capital, Toronto is situated within the Golden Horseshoe in Southern Ontario on Lake Ontario’s northern shore. With a population of almost 3 million, it’s the biggest Canadian city and fourth-biggest city in North America. A megacity, Toronto is a hub of finance, business, culture, and arts, and is known to be one of the world’s most diverse and multicultural cities. The Toronto map poster below shows how people think of their city by region. 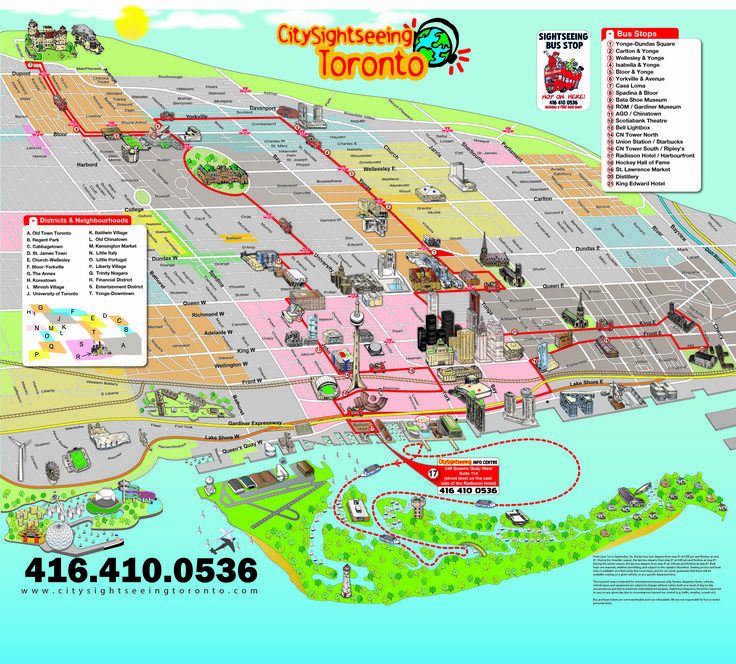 This is a funny map that shows how people of Toronto see each area of their city. 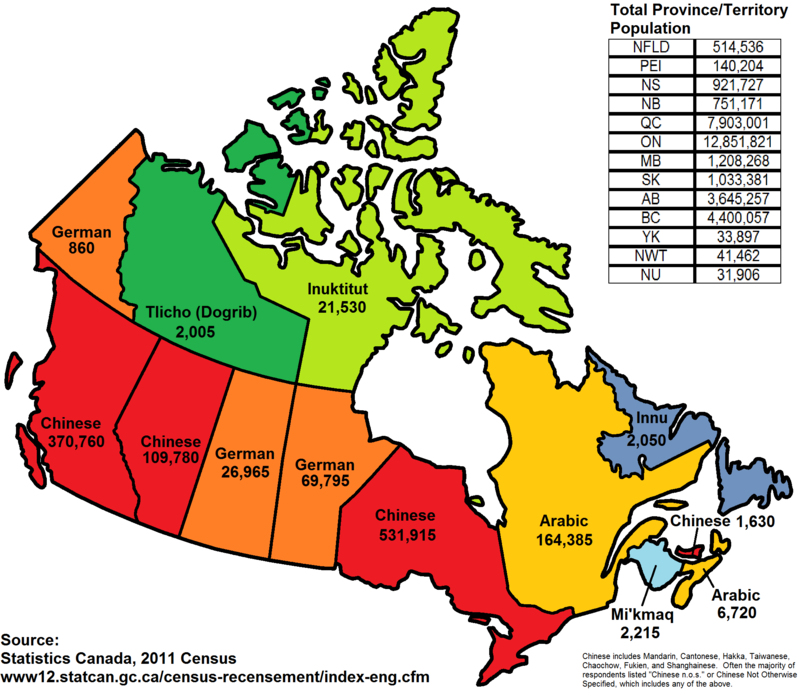 This map shows the widely spoken language in Canada by region. Although Canada has English and French as their two official languages, French is the 12th most spoken language in the city. Toronto has the biggest Italian population outside of Italy. Toronto was once called York, the Upper Canada in 1793. Analytics show that Toronto is one of the most livable cities in the world along with Sydney, Brisbane, and Vienna. Analytics also shows that Toronto is North America’s safest city. With a population that almost reaches 700,000, Baltimore is Maryland’s biggest city, which covers an area of over 80 square miles. Not too far from Washington DC, Baltimore is located on the eastern coast of America and has an important port, equipped with the big harbor. 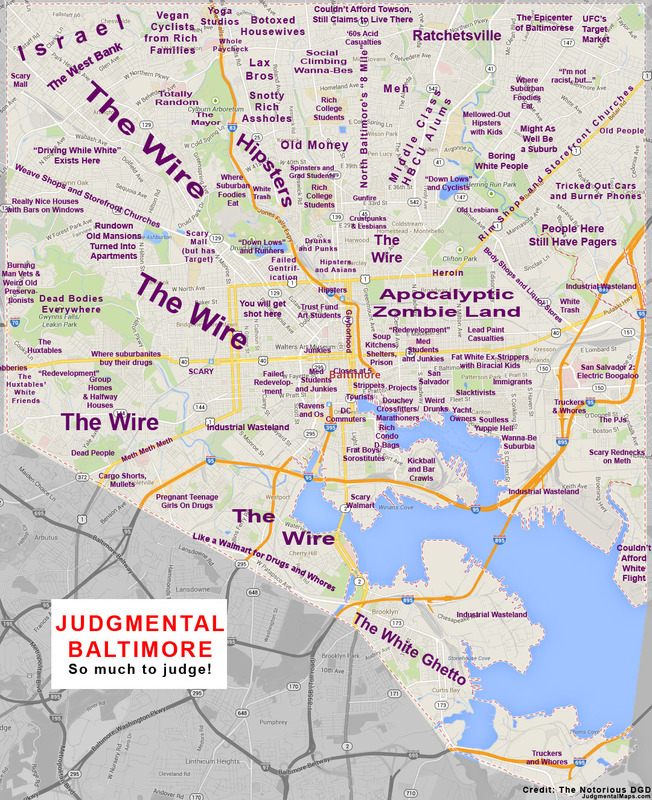 Below we attached a funny Baltimore map poster showing the common stereotype of each region. It also shows a map where most crimes take place. This is a funny Baltimore map poster showing the common stereotype of each region. This is a map that shows where crimes in Baltimore usually takes place – be aware when visiting. Baltimore was the very first US city to light its streets with hydrogen gas in 1816. The world’s first dental school was established in Baltimore in the year of 1840. The United States’ first post office system was installed in the city in 1774. Snowballs were invented in the city throughout the American Industrial Revolution. Another populous city in the United State is Georgia’s capital, Atlanta, with an estimated population of almost 500,000. Hometown of Martin Luther King Jr., Atlanta is a great place for history buffs, and getting to the hub of Sweet Auburn, the leader of civil rights’ old neighborhood, has now become easier thanks to the help of Atlanta map poster. This is a funny map showing how people of Atlanta see their city. This shows the interesting population density in Atlanta. This shows the comparison between Georgia state and Netherlands, and as you can see, in Georgia state, the densest place is Atlanta. Atlanta has the second-most shopping center space in the U.S.
Atlanta was the only city in North American destroyed as an act of war. One of the largest Hindu temples outside of India is located in the Atlanta metro area. The capital of Germany, Berlin, is also the largest city in Germany because it is home to more than 3.4 million people. Geographically Berlin is located on the west side of the border with Poland. The distance is about 44 miles apart. Berlin City is rich in natural beauty having a lot of greenery and grass plains that with the help of government have been transformed into beautiful parks. 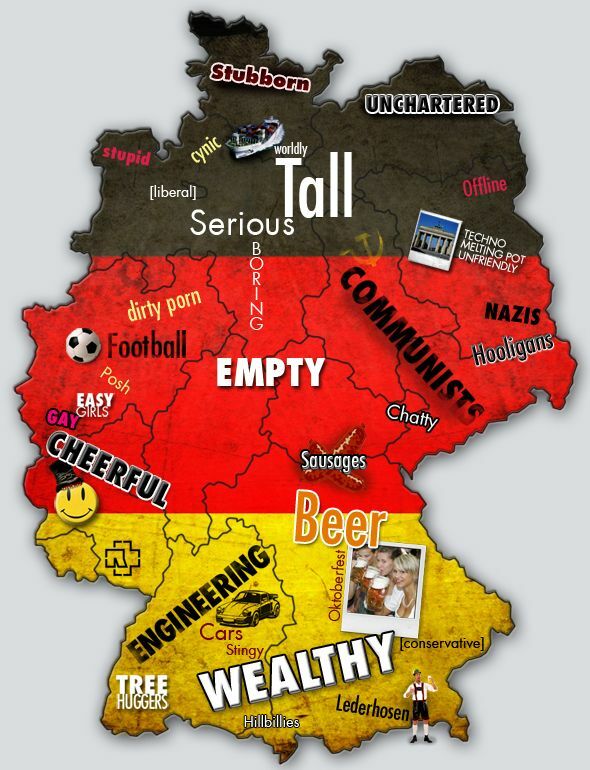 This is a funny map that shows stereotype labels for Germans. 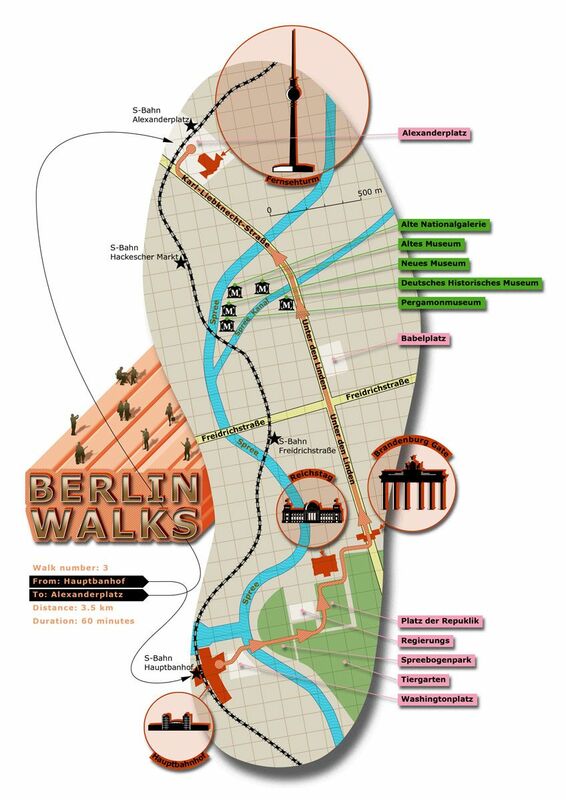 This is an infographic that shows a visual walking map of the city with a path that takes you to all the interesting locations in Berlin. In terms of total area, Berlin is one of the largest cities in Europe. The capital of Germany could fit 9 cities the size of Paris in its territory. Berlin has as many as 1,700 bridges, which makes it a worthy rival of the spectacular Venice. The city has around 6,500 restaurants, 550 ice cream parlors, 2,800 sandwich shops, 225 bars, clubs and other food, drink and entertainment venues. Berlin has more zoo animals than any other city. In the past, due to being divided, the city had two zoos, which still operate in different parts of Berlin. With a population of 673,184 as of 2016, Boston is the most populous city in Massachusetts. Furthermore, Boston lies inside a big metropolitan area, the 11th biggest in the country. 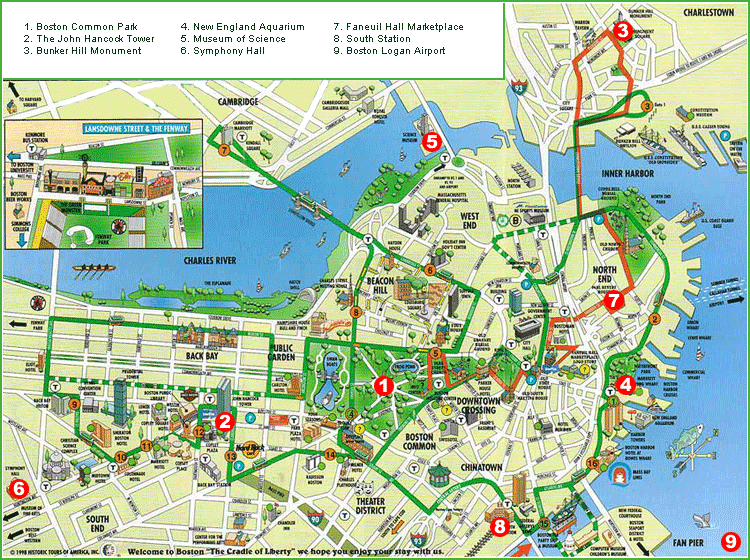 This city, also known as “Greater Boston,” is home to interesting culture and attractions. This city is normally considered the unofficial business and cultural capital of the state. 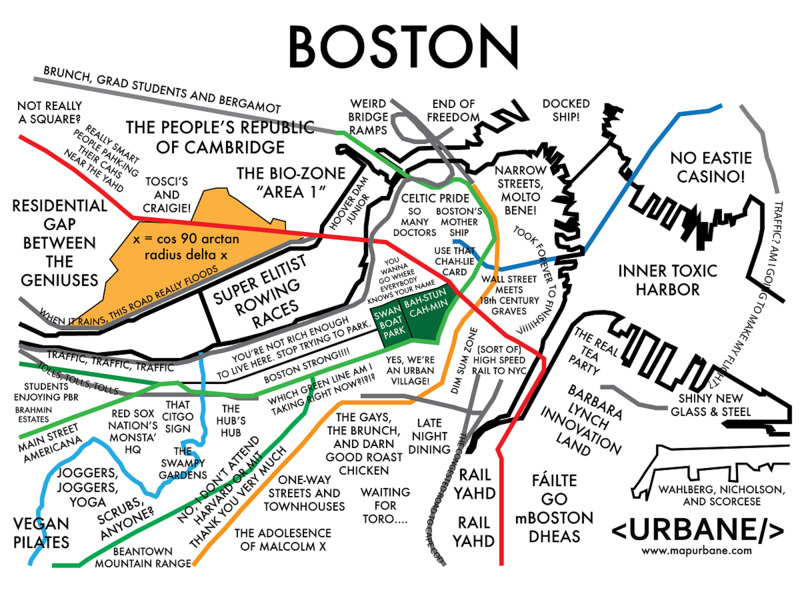 This is a funny map that shows how people from Boston seen their country. 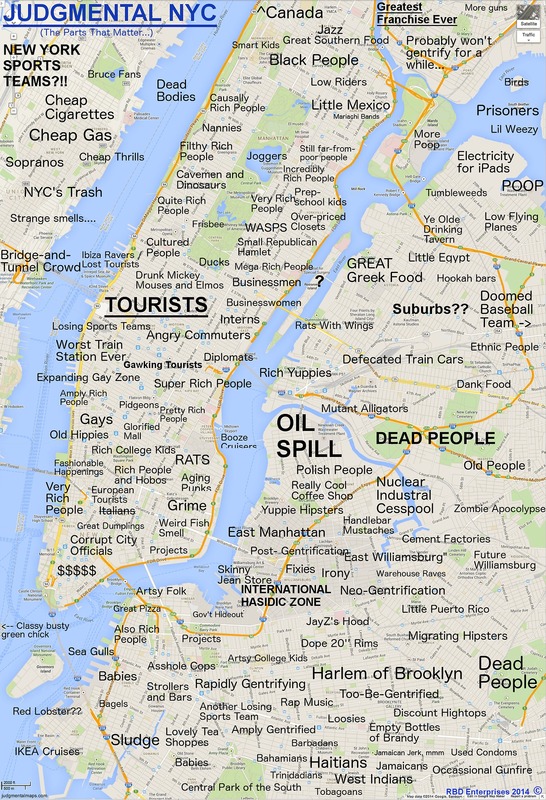 This is another map that will make you laugh showing the stereotype of the city. The country’s oldest fire department is Boston Fire Department which was established in 1678. Boston is named after an England town. “Happy Hour” was banned in the city since 1984. The first chocolate factory in the country is established in the city. We have talked about the Big Apple as well as the Windy City, now it’s time to talk about the City of Angels. Los Angeles, which in Spanish means “the angels” is a wonderful destination if you are looking for some sun. Modern Los Angeles is a truthfully global city with a great influence on global trade, business, entertainment, sports, culture, fashion, science, media, research, education, medicine, and technology. The number of cars in the city is higher than the number of people. 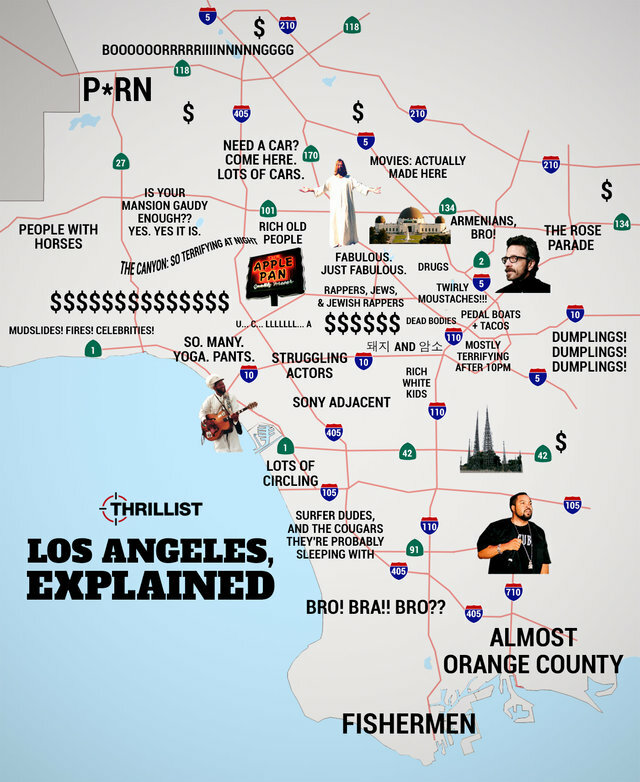 Beverly Hills used to be just a modest lima bean ranch. 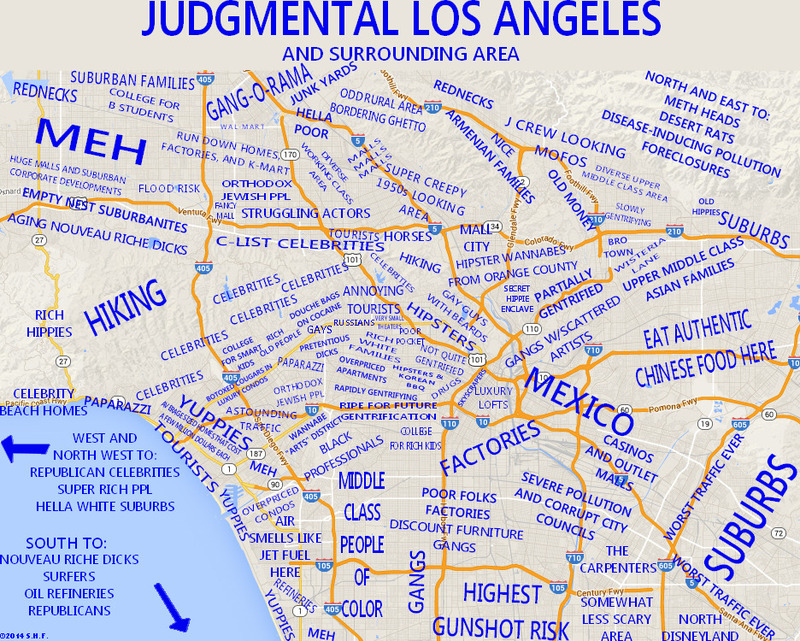 If Los Angeles was a country, its economy would be larger than Switzerland, Saudi Arabia, and Sweden. 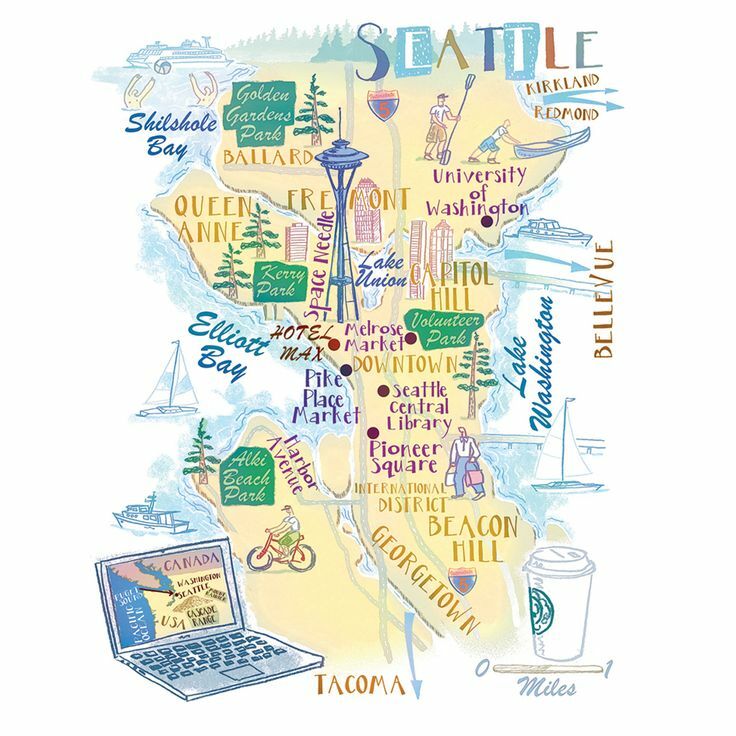 Seattle, Washington is possibly best known as the origin of Starbucks Coffee and Grunge music. Seattle is also paving the way again as one of the greenest cities in the United States and is living up to its nickname as the Emerald City. The first song of Beatles song was air on a radio station in Seattle. There were about 140 thousands dogs, and just 93 thousand human children living in the city.  Seattle has been ranked the top literate city in the country. The Seattle Public Library system has the highest number of library card-holders per person in the United States. The annual rainfall in Seattle is less than that of Chicago, Houston, and New York Map Posters. Hopefully, you found these maps helpful and will bookmark this article for when you decide to go on a new adventure. City map posters are a great solution for having easy navigation around a certain location while escaping the technological revolution. Moreover, once in a while you might want to hang your favorite travel destination at home to remember the good time you once had. So never throw out the map you used to explore the city. May it be New York map posters or Paris map poster – trips come and go but memories will always be there. Grafomap is here to help you create meaningful gift for your loved one or design a beautiful wall decor to personalize your space. Since Jan 2016 we combine geodata and design layers to let you create map posters of your most cherished places.